Well, my friends, we are two days in to the year 2015! I don’t know about you, but I am excited for a fresh new year, with new experiences and opportunities to learn and grow. While I don’t usually make new year’s resolutions, my goal for this year is to approach life with more positivity. I have a tendency to complicate a situation with over-thinking and worrying. This year, I’m striving to quiet the negative self-talk and stay in the moment, instead of imagining everything that could go wrong. It’s not going to be easy, but change never is, whether it’s adopting a new exercise program, eating healthier, or saving money. In addition to clearing out old thought patterns, I’m working on cutting out the clutter in our home. It feels so good starting the new year with less stuff hanging around. I’m all about simplifying this year, in all areas of my life. Sometimes, the simple things are the best. Speaking of simple, let’s talk about some yummy five-minute toast! Creatively topped toast seems to be everywhere these days. I, for one, love this trend. 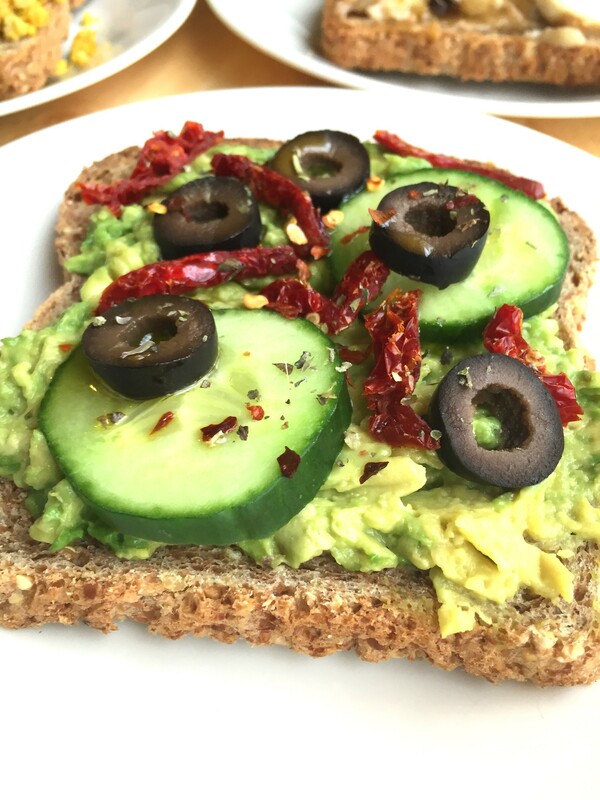 The first time I tried avocado on top of my toast a few years ago, I was hooked! Almond butter topped with sliced apples or pears with a sprinkle of cinnamon is another old stand-by. While I’m not re-inventing the wheel with these toast ideas, I hope to inspire some of your own creations! 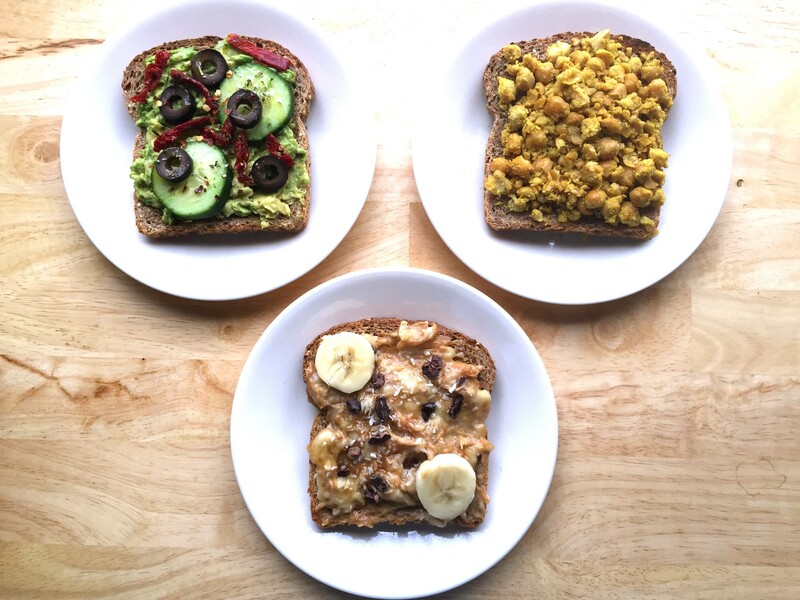 These toasts are simple, and can be made up in minutes. Just a few small touches make this toast feel special, even gourmet. They’re a fast, easy, and nutritious option for fueling you through your morning or afternoon. Or serve alongside some nice hot soup for an easy dinner. You may or may not know that Elvis’ favorite sandwich was grilled peanut butter and banana. While I love a grilled peanut butter and banana, this impersonator is just as obsess-worthy. It’s also a bit healthier, and even quicker to make. It features some special healthy and tasty additions, making it a grown-up p.b. and b. This Mediterranean-inspired toast is a spin on the traditional avocado-topped toast that I enjoy at least a couple times a week. Cucumbers, black olives, and sun-dried tomatoes add vibrant flavors, while red pepper flakes give it a little kick. I’ve made this particular combination several times this week, and I can’t stop thinking about it! It’s definitely my favorite combo so far. 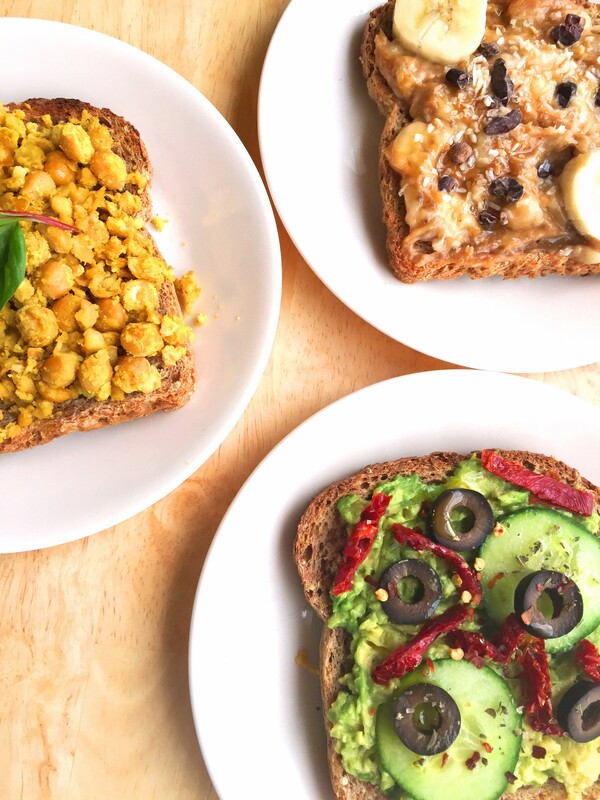 If you like Indian flavors, you will love this easy toast idea. Chickpeas are a great source of protein, fiber, iron, and zinc. A drizzle of olive oil ups the healthy fats, while a squeeze of lime adds a bit of vitamin C to help absorb more nutrients. 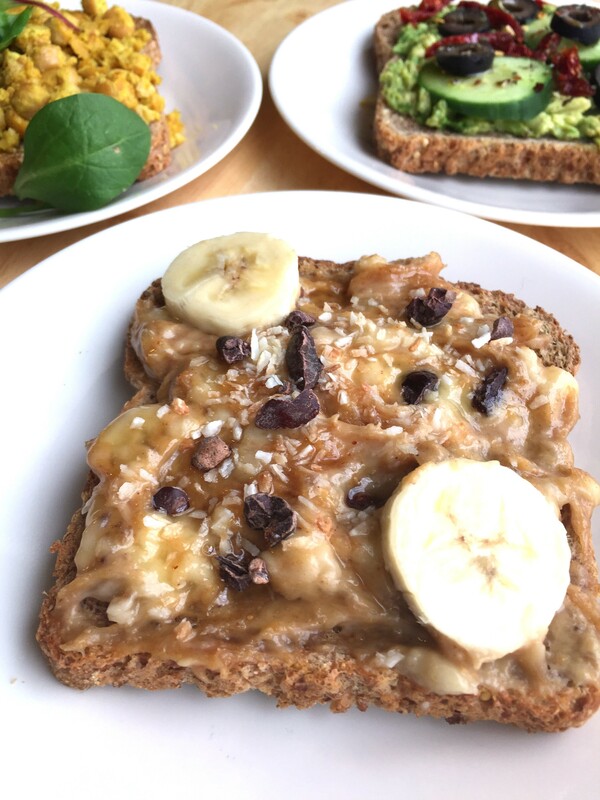 This toast will help you push through your busy day with tons of energy, or makes a great pick-me-up snack for those afternoon slumps. Instructions: While your bread is toasting, mash and mix banana and peanut butter in a small bowl. Spread over toast and top with a drizzle of honey or maple syrup, cacao nibs, coconut, and a tiny pinch of sea salt. 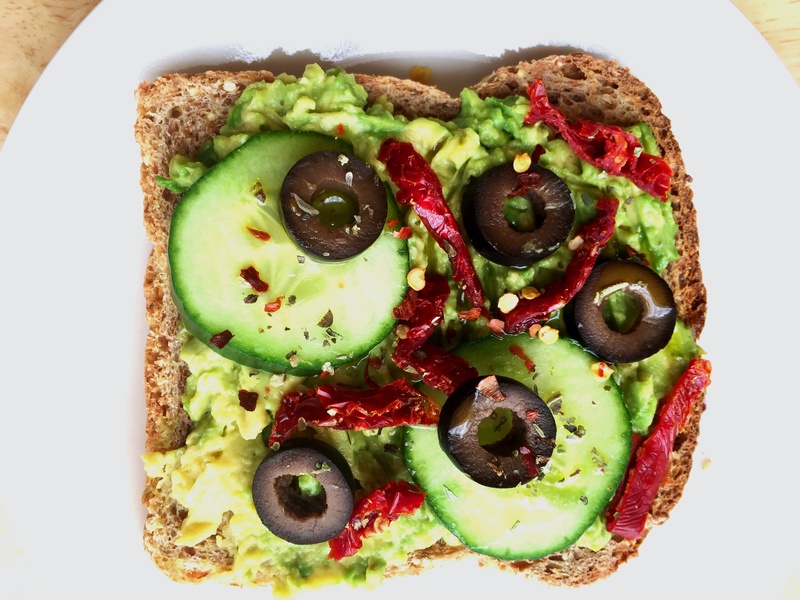 Instructions: While your bread is toasting, roughly mash your avocado and spread on toast, top with cucumber, olives, sun-dried tomatoes, and a drizzle of olive oil and sprinkling of seasonings and salt. I’ve been dying for filling and energizing breakfasts that I can cram down my throat on the subway, and the Elvis Impersonator is IT! 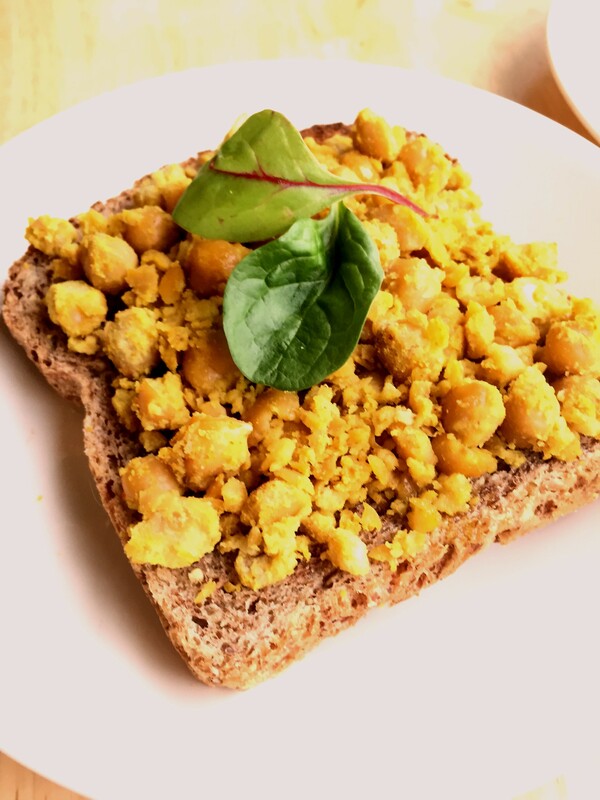 I love the Indian Chickpea one….I can’t stomach savory for breakfast, but it looks like a killer lunch addition! Although I don’t think my dinky GF bread would be able to harness a whole can of beans. You know how those damn breads are! So glad you liked the toast ideas, I hope you give them a whirl! I know all too well the fragile nature of a gf slice! Might have to use a fork. Or perhaps a gf wrap? And thanks for alerting me to the fact I did not actually specify how much chickpea mixture to put on the toast, it’ll be about half, so there’s enough for two toasts! Thanks for stopping by and taking the time to comment, much appreciated! This post on feedingyourbeauty.com really inspired me! I am always struggling with snacks and things I am “allowed” to eat on this lyme diet. I get sick of the same old things, but today my snack was a welcome and refreshing change. This is my take on Larice’s awesome toast toppers. I call it “The Green Goodness”. Awesome!!! Thanks you’re the best Larice! !